Sorry folks, I have been absent from the scene for a while. My day job kept me busy, too busy, i.e. away from wine appreciation and culinary exposure trips. Frankly speaking, I had the chance to sample some good wines (alas) but I had no time to write about it. 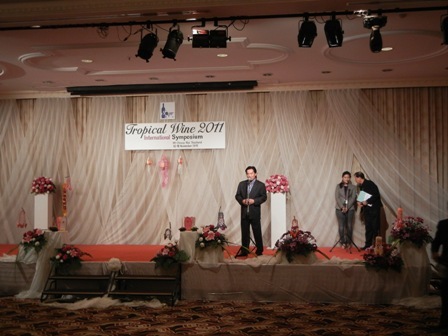 the 3rd International Symposium on Tropical Wine. Boy can you believe it, me the amateur among all these experts, the wine makers, vineyard owners, oenologists, scholars and wine scientists. These serious guys come from many countries. Tonight at the welcome reception I talked to people from Thailand, India, Myanmar, Brazil, France, Australia, South Africa and my native Germany. As most scientist, the organizers did not waste words, but went right into the serious stuff and invited all the participants to indulge in tasting the wines on offer from Brazil, Myanmar/Burma and the host country Thailand. At first I was a bit hesitant but then joined in the tasting wholeheartedly. I found it so interesting to talk to the wine-makers and vintners, and listen to the experts who went from table to table. I cannot say which wine and/or winery I liked most. One thing is for sure Terry Cummins and the others at the organizing committee did an awesome job in getting this conference together and running. Tomorrow the serious part of the symposium is going to start. I will need some good sleep to get ready for the many presentations and talks. Seeya tomorrow. 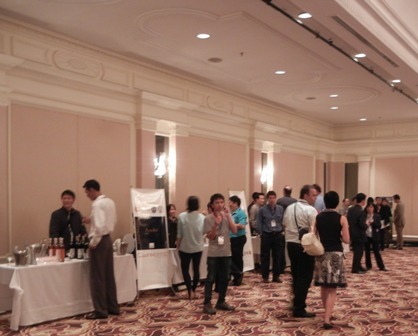 PS: The Thai Wines Association has currently six members, all of them professional and enthusiastic vintners. Congratulations to you for getting such a distinguished crowd of exerts together, luring them to come to northern Thailand during these times of floods is not an easy thing to do. This entry was posted on Sunday, November 13th, 2011 at 9:31 pm and is filed under culture, general, vines, vineyards, wine, wine regions, wineries. You can follow any responses to this entry through the RSS 2.0 feed. You can leave a response, or trackback from your own site.